Each design borrows from the past; yet MORPHIC timepieces has changed the watch form to cater to the 21st century. The finest surgical steel is used to encase a high precision quality watch movement. Each watch offers a unique design revealing the future has arrived. MORPHIC owners refuse to settle for the classic design. Old school philosophy is appreciated; however the MORPHIC owner sees the future as positive and looks forward to tomorrow. Too many people recall the past; claiming "those were the good old days;" the MORPHIC owner claims the future is now; exciting and the best is yet to come. 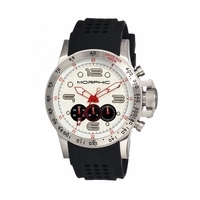 Watch the changing of time with a MORPHIC timepiece .